Hey hey! 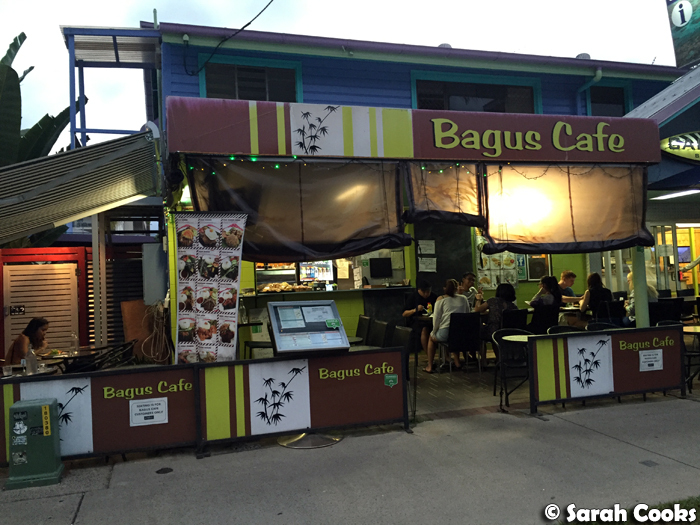 As promised, here's my post on the food we enjoyed on our trip to Cairns! Overall I found restaurants there to be quite expensive, with main dishes easily hitting $45, but I suppose that's to be expected in such a touristy town. 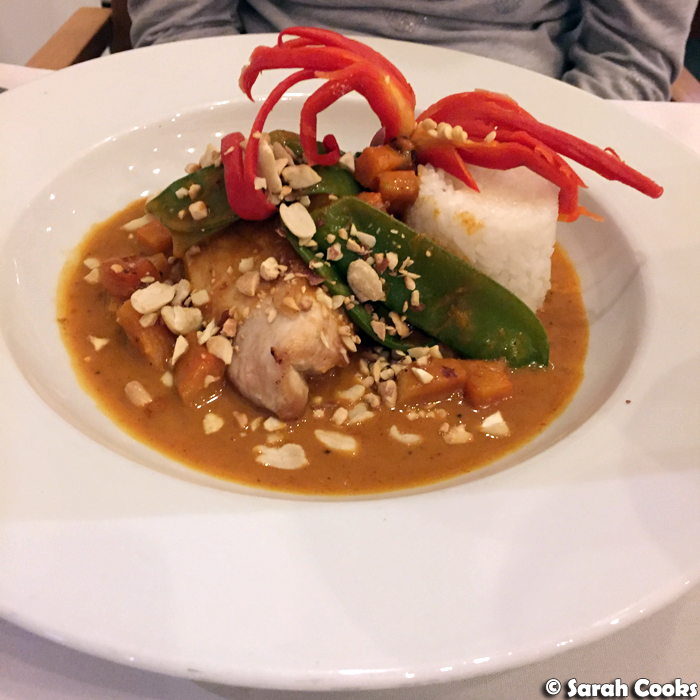 Cairns isn't particularly known as a foodie destination - for tourists, the drawcard is definitely the amazing natural attractions - however, we managed to eat well. (This was mainly thanks to Sandra's awesome pre-trip research and preparation!) Let's take a look! 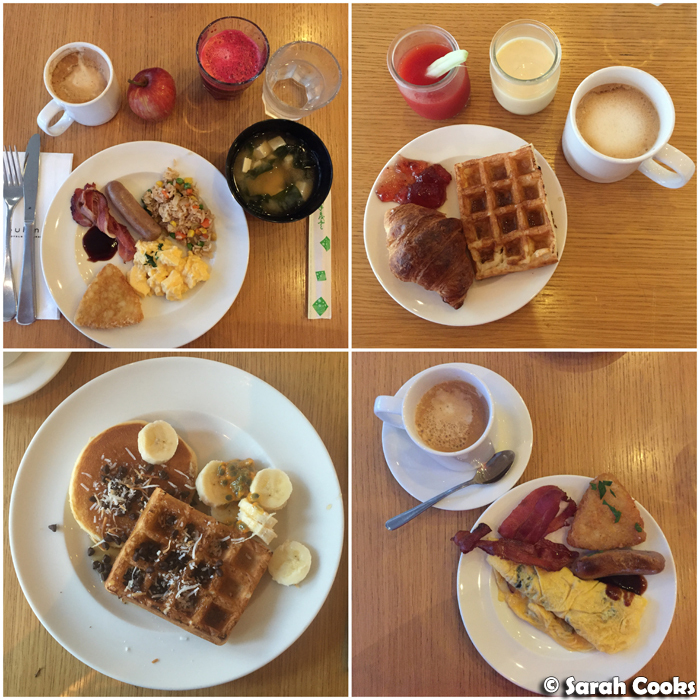 The first place where we ate was our hotel's in-house restaurant, Coco's Restaurant. We arrived in Cairns late-ish on our first night, and wanted something easy and close, so that we could rest up, ready for a big day of sightseeing and activities. 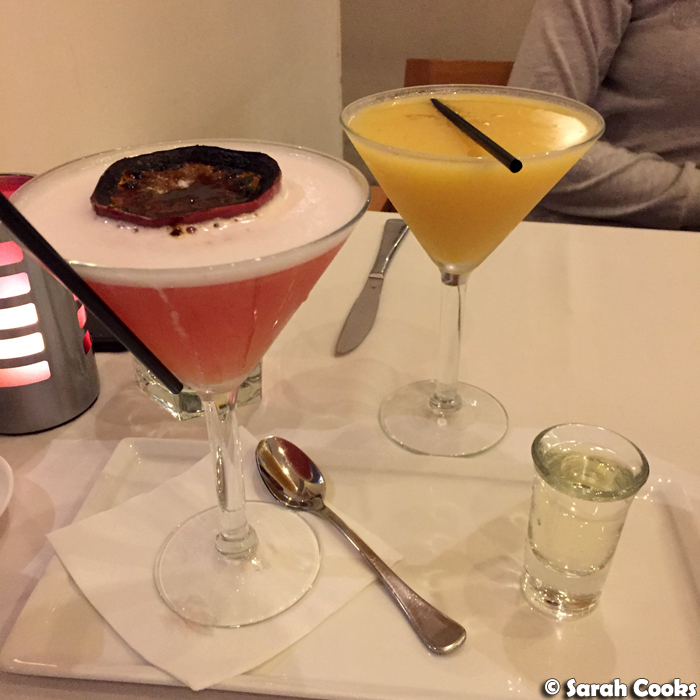 Normally I hate tackily-named cocktails, but I couldn't resist the Pornstar Martini, with its passionfruit, vanilla and pineapple, plus a bonus shot of prosecco. Cheers! 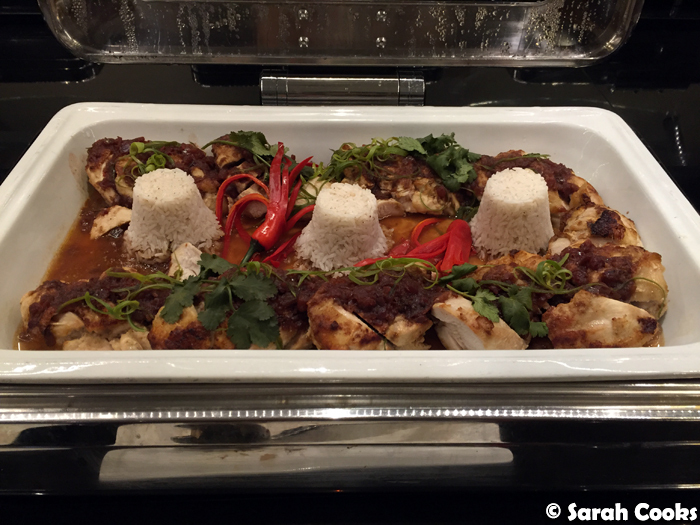 Sandra had a simple but tasty chicken curry. It wasn't particularly spicy but had a nice rounded flavour. 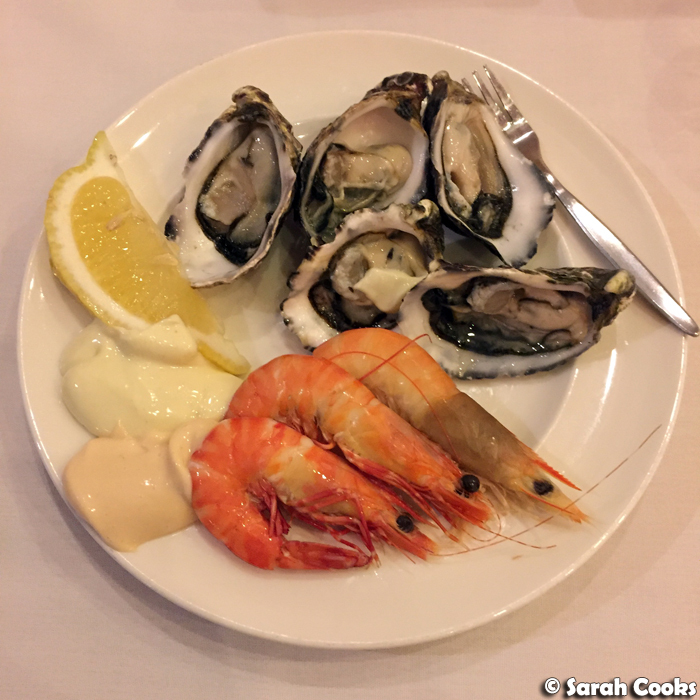 I splashed out on the seafood buffet, ($83 per person, $63 for Le Club members). I have to say, I wasn't impressed with the seafood at all. 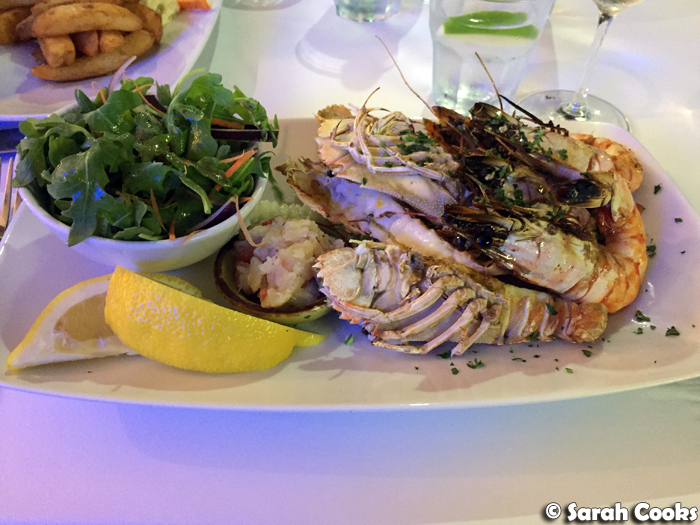 The selection was small (just prawns, oysters and crab), and most disappointingly, most of the prawns weren't fresh. I only managed to find three decent ones. 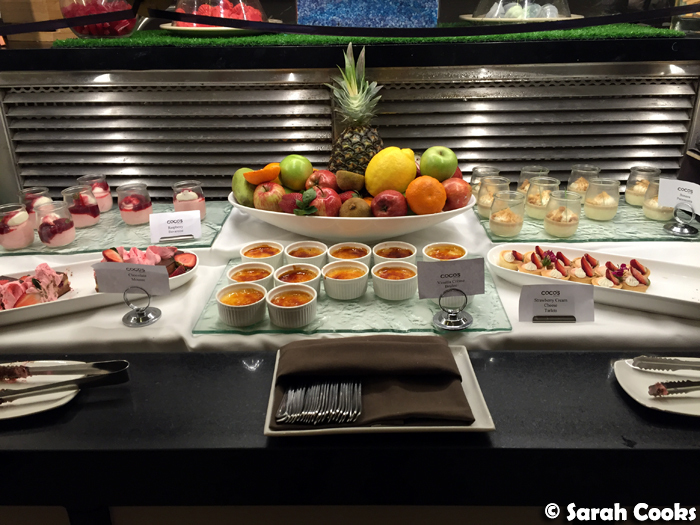 However, the buffet also had a wide selection of very good hot dishes and desserts, so it wasn't a total loss! I wouldn't go out of my way to do the buffet at Coco's, but it's not a bad option if you happen to be staying close by, and especially if you're eligible for that Le Club discount. 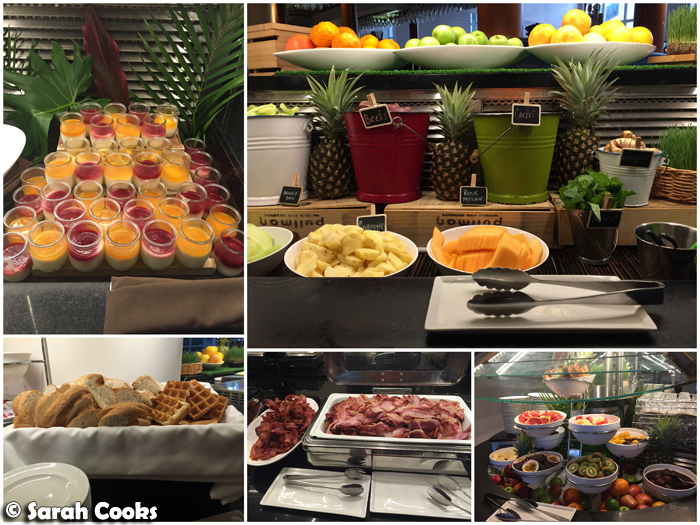 Our room rate included breakfast, and the breakfast buffets were great! 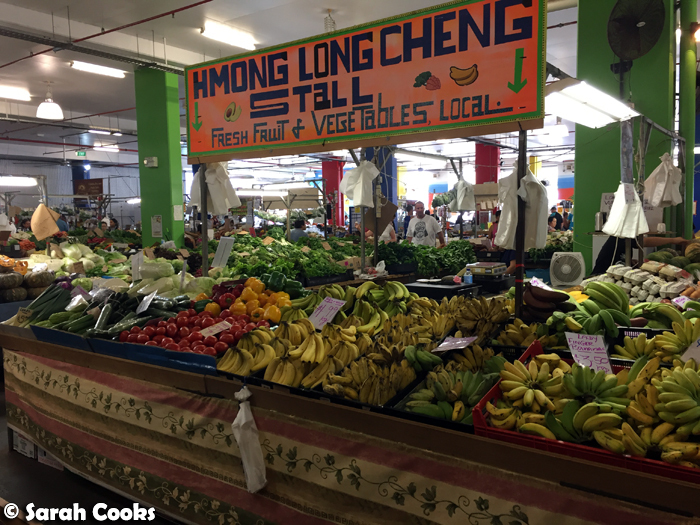 There was a wide array of fresh fruits, a DIY juice machine, yogurts, smoothies, pastries and breads, egg station, western and Asian hot food and more! The Raw Prawn is a popular restaurant in a lively area of the city - it seems to get busy quickly; I'd recommend booking a table. 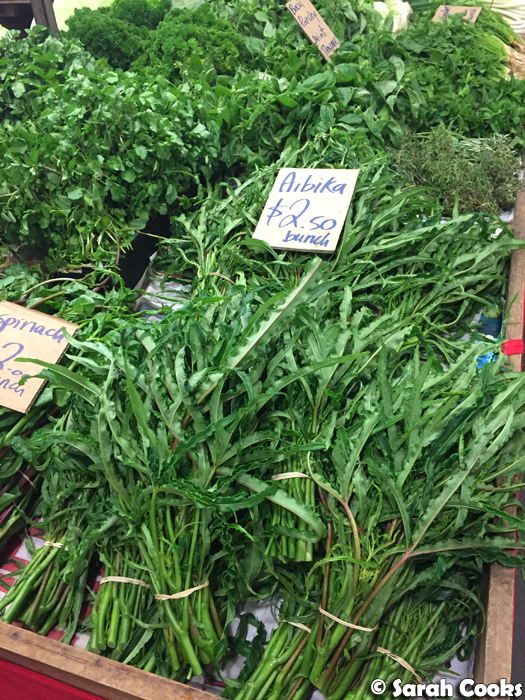 They specialise in seafood, but also have meats, pastas, and Australian game meats. Sandra had a nice steak and chips (you can just see the chips in the below photo), and I had a lovely mixed seafood grill, with prawns, calamari, bugs and barramundi. 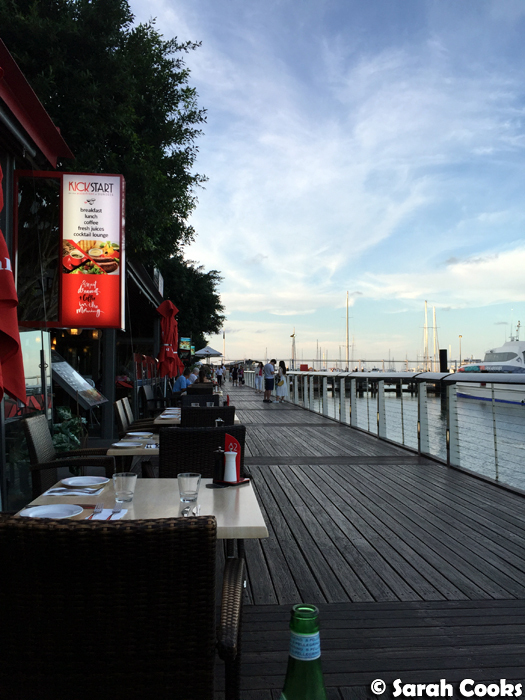 Dundee's restaurant is a huge waterfront restaurant, which, like The Raw Prawn, offers the usual selection of seafood, meats, pastas and native meats. This is definitely a tourist restaurant, with menus in different languages and lots of big tour groups coming through. Don't let that put you off! Service was friendly and efficient, and the food was very good. 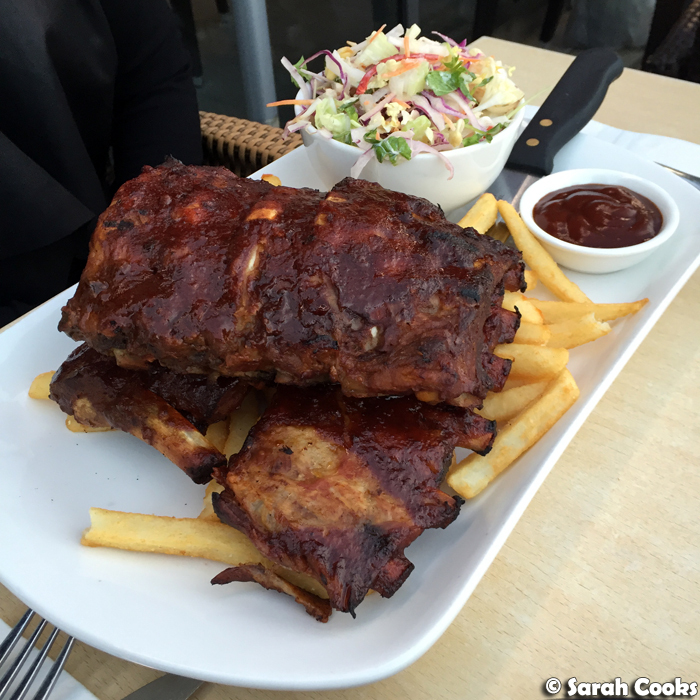 The serving of ribs was almost comically large, but so very tasty, with the basting of barbecue sauce and the chargrilled edges. 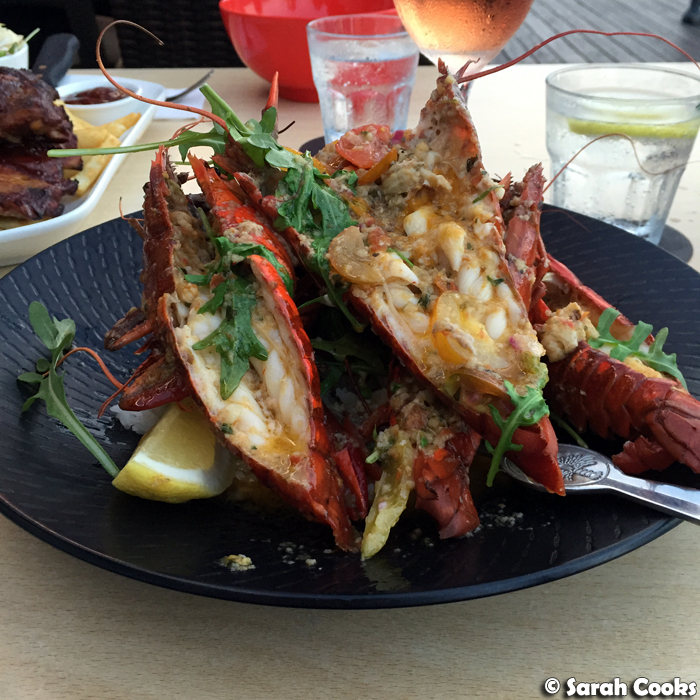 I ordered the local tableland yabbies, and these were easily the best thing I ate on the whole trip! The yabbies were incredibly fresh and tender, served on a bed of flavourful seasoned rice, and coated in a delicious garlicky sauce. So good! I took my time eating this and made sure I got every last scrap of wonderful goodness. 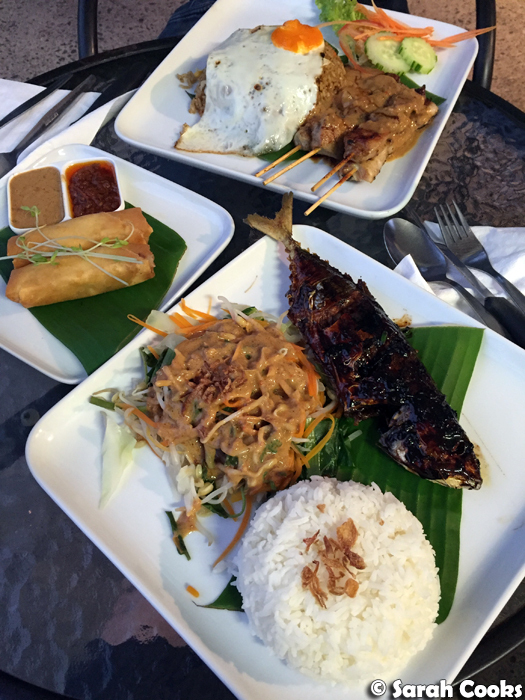 Possibly would fly back to Cairns just for this dish. 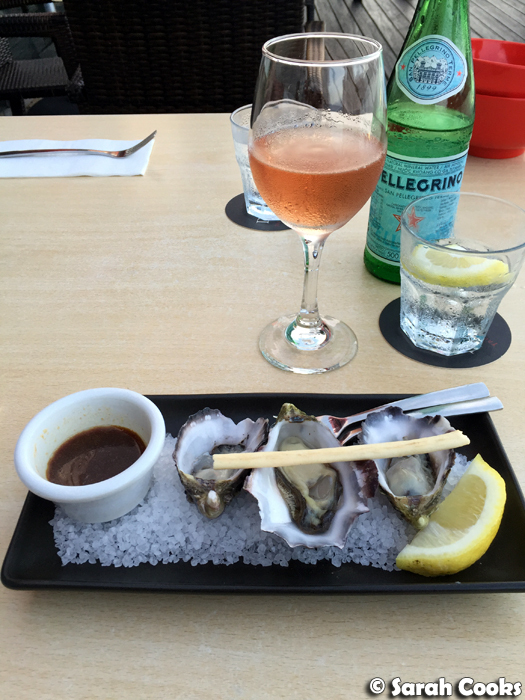 Another night, we had dinner at Ochre (6/1 Marlin Parade, Cairns QLD, 4870), an upmarket restaurant that had lots of good online reviews. I've decided not to include any photos of the meal here, as it was extremely disappointing. It took a good hour for our food to come out, and unfortunately it wasn't worth the wait - the prawn and rice noodle in coconut laksa was very bland and served lukewarm. Sandra ordered the twice-cooked duck, which was nice enough, but totally didn't match the strongly-flavoured Brazilian rice and beans that it came with. Based on our experience here, I think you'd be better off at a restaurant that serves simpler cuisine (like The Raw Prawn or Dundee's). The night market is a fun place to visit, with lots of stalls selling souvenirs, massages and so on. 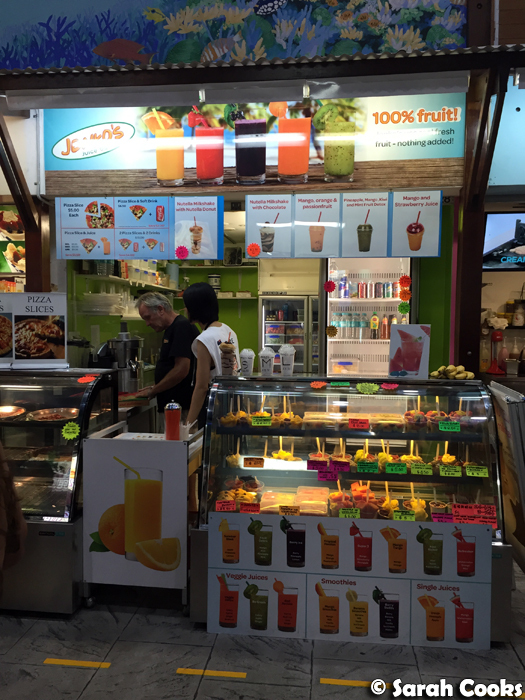 There are also some good food stalls around the front, selling fruit, juices, waffles and other snacky items. 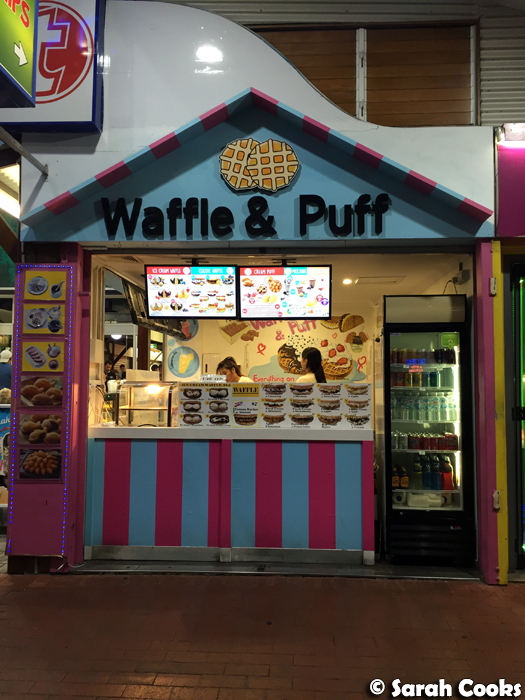 We visited here after a big meal (at The Raw Prawn, actually), so unfortunately I was too full to do a full waffle with ice-cream. 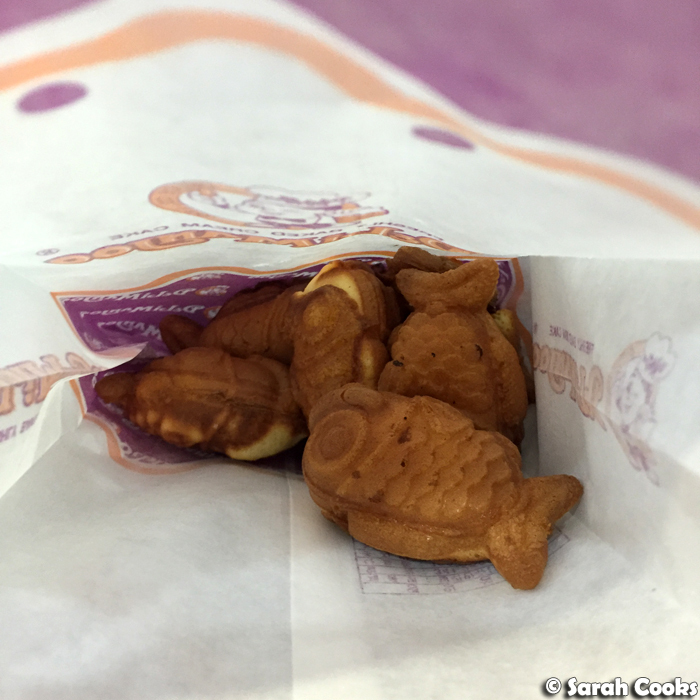 But I got some of these fab Delimanjoos (mini-fish shaped waffles filled with custard) to nibble on as we walked around. 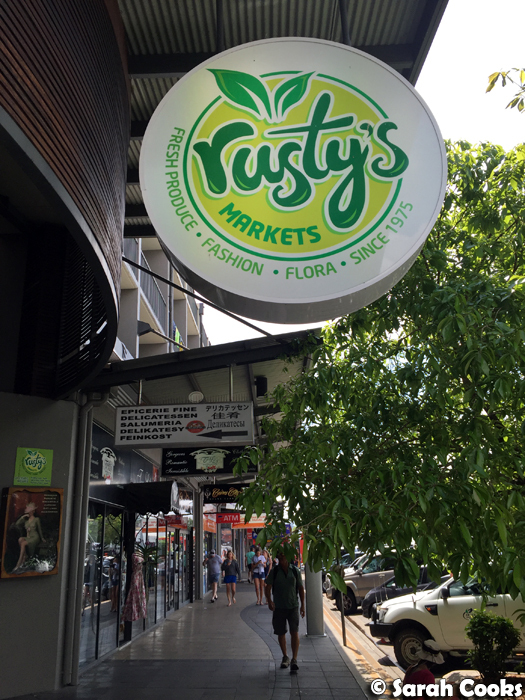 We visited Rusty's Market one afternoon, and I think this was a wonderful antidote to the expensive restaurant food we had on the rest of the trip. 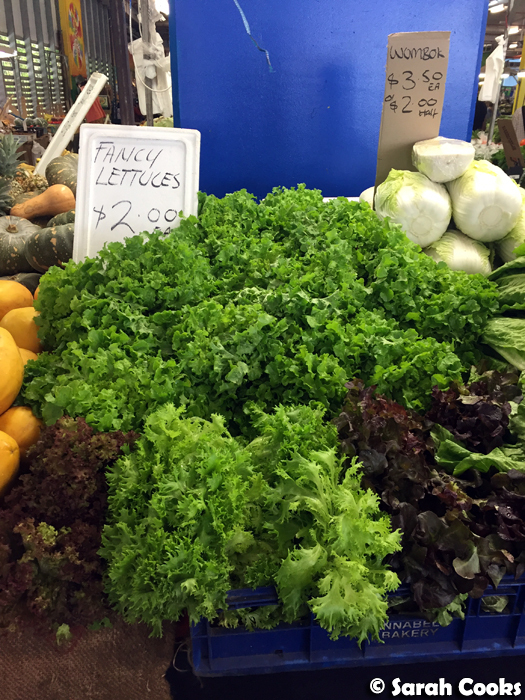 This is a proper market, with loads of fresh fruit and vegetable stalls. 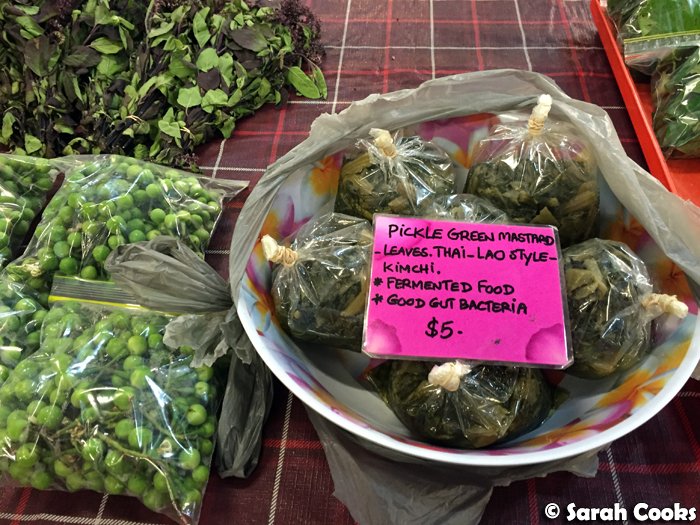 I loved wandering around the different stalls, and highly recommend visiting here if you're in Cairns. 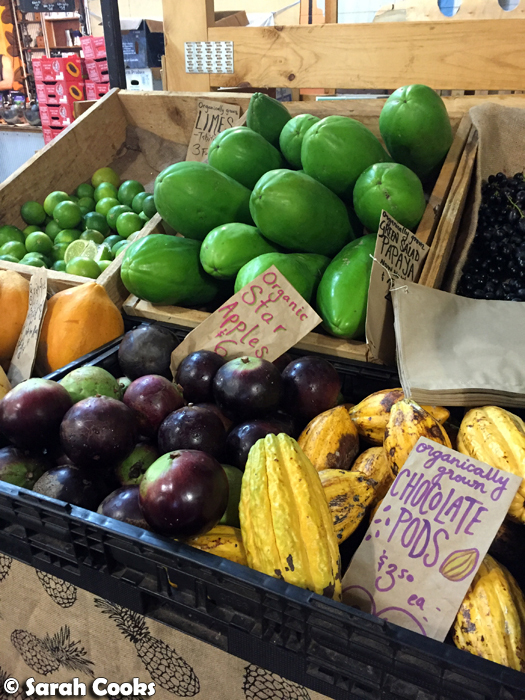 We also managed to find lots of exotic tropical fruit, (well, exotic to us, normal to locals), like jaboticaba, star apples, and black sapote, that we bought and took back to the hotel to try. Chocolate pods! Star apples! 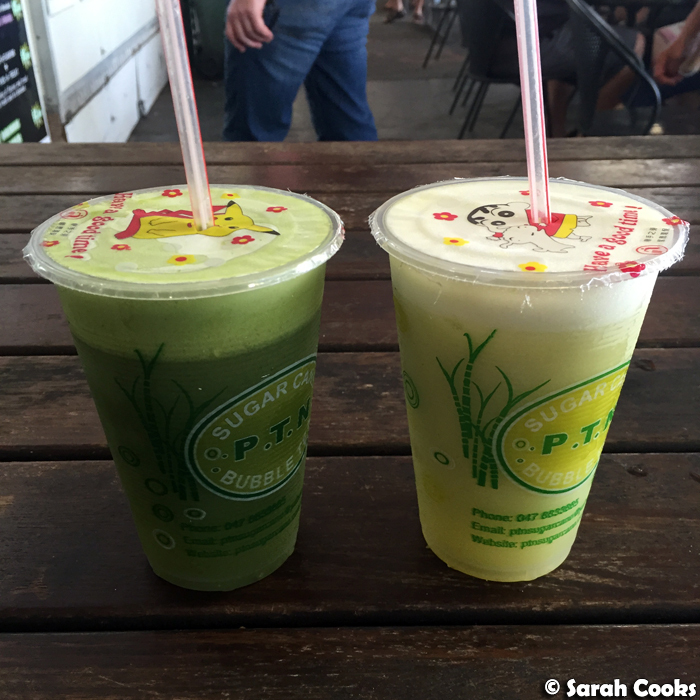 Green papaya! 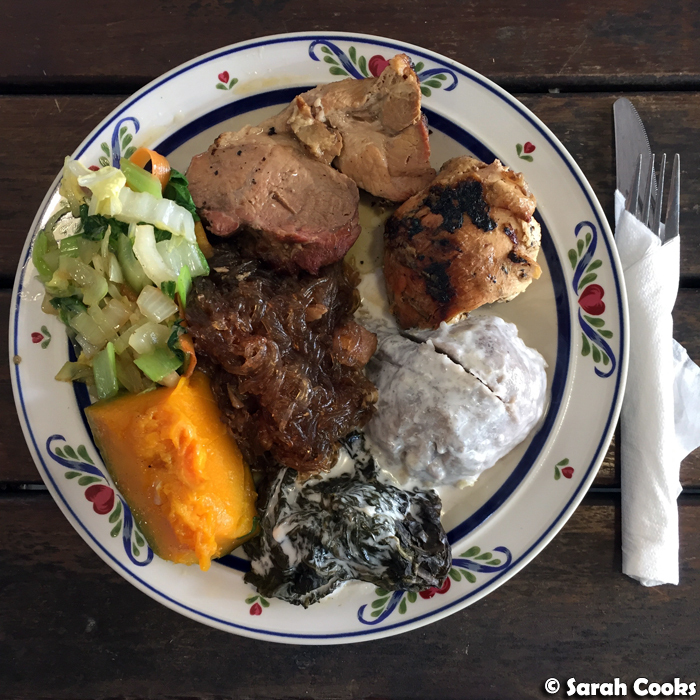 ... whilst I got a plate from the Samoan truck. I'd never had Samoan food before, so was super excited to try it. I got this lunch plate so I could try a bunch of different things. It was only $10, and such a generous portion! There was barbecued pork and chicken, taro and taro leaves cooked in coconut milk, pumpkin, stir-fried green veggies and chop suey. I loved it! Let's finish up with a little sweetness! 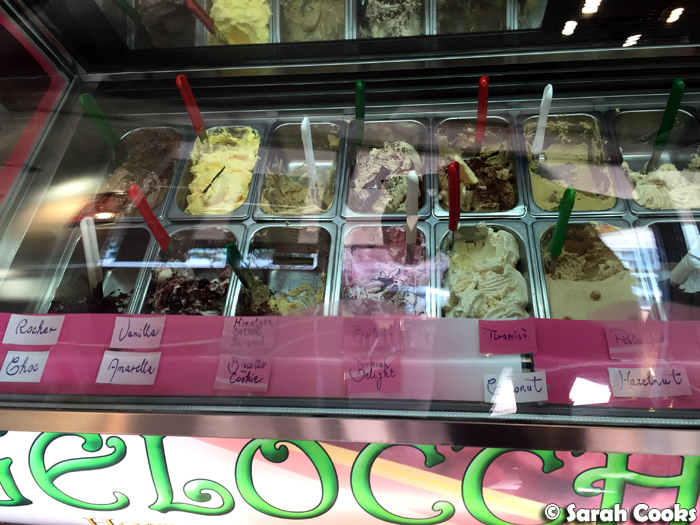 Being a tourist town, there are dozens of chain ice-cream shops in Cairns, but Gelocchio is a little special. 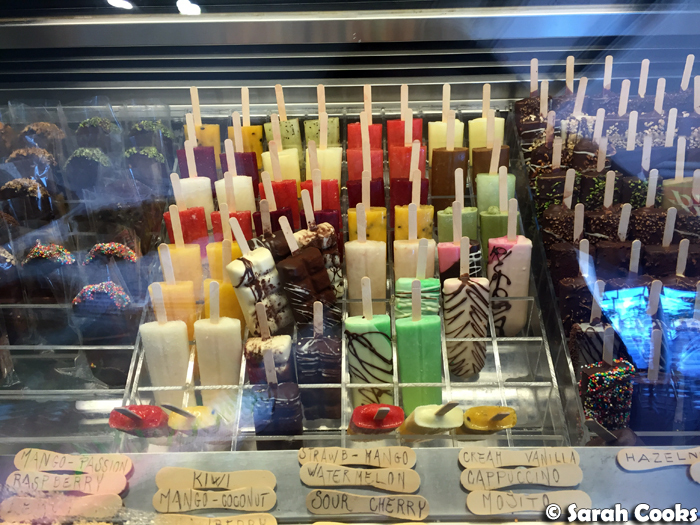 Making their own Italian-style gelato and icy-poles with fresh local ingredients, they're definitely worth seeking out. 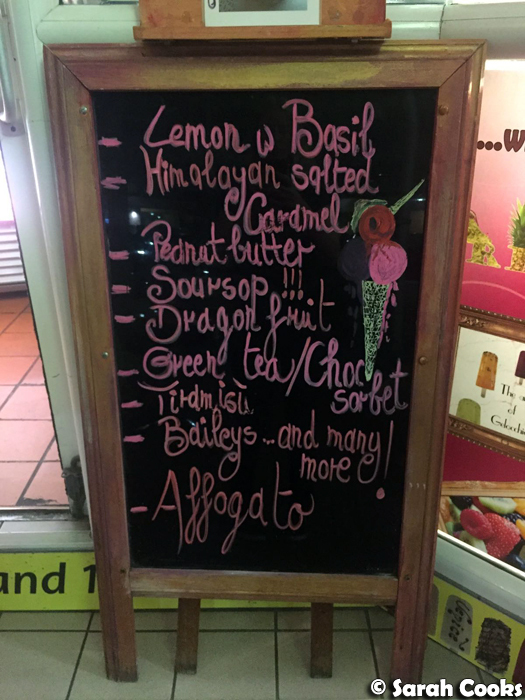 We visited twice on our short trip to Cairns - once for intensely magenta dragonfruit icy-poles, and another time for fabulous gelato. 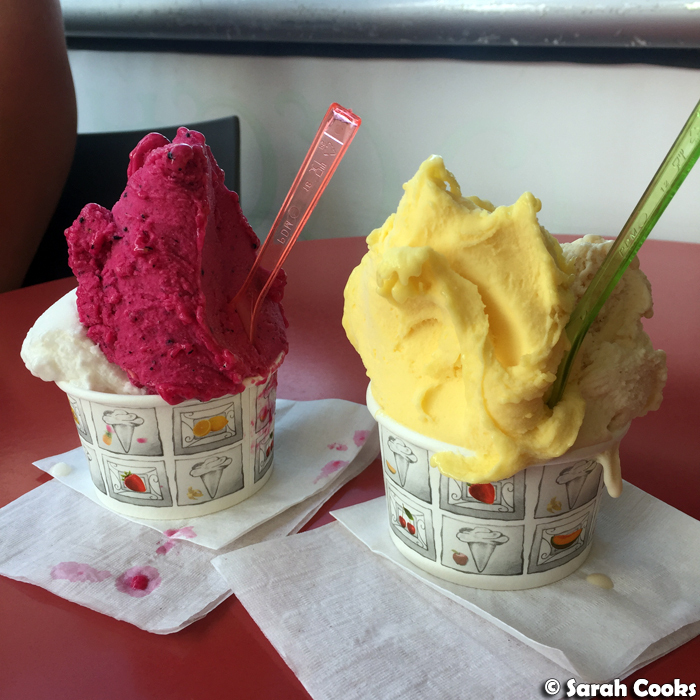 All the flavours we tried were excellent, with really clean and pure flavours. My favourite was the peanut butter - so peanutty, so delicious! I only wish we had the time (and appetite) to try more flavours. 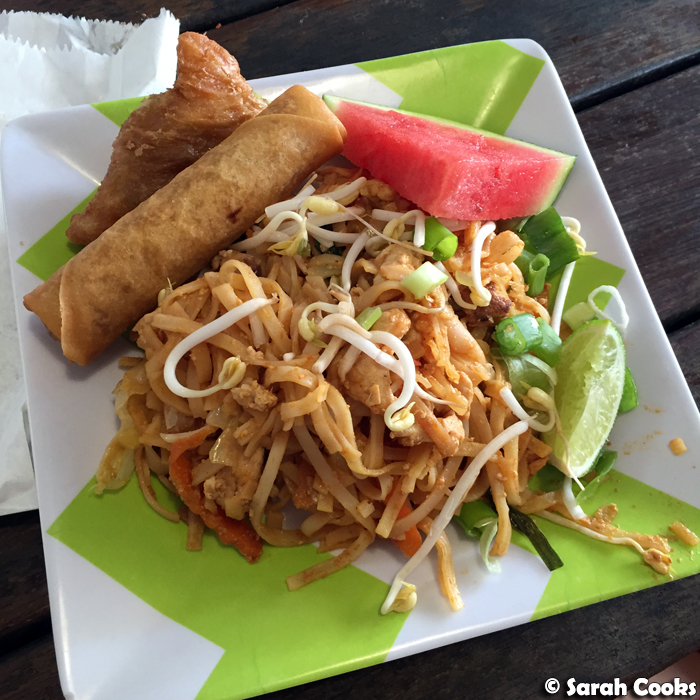 Do you have a fave foodie destination in Cairns? Leave me your recommendations in the comments! So much good food but the Samoan plate really caught my eye. 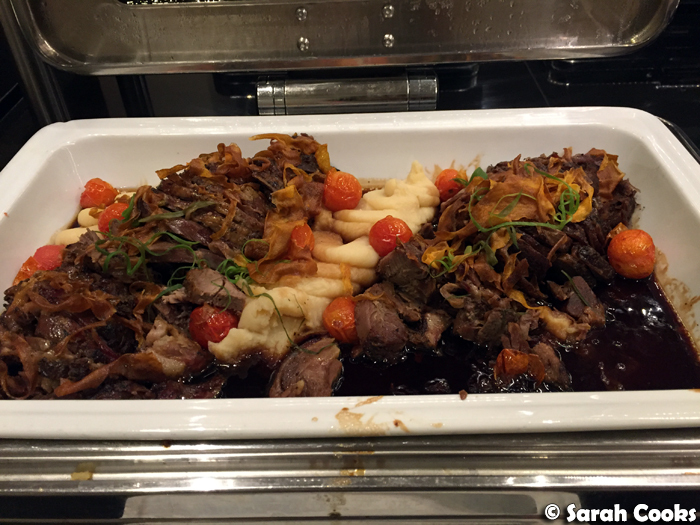 I have had Hawaiian food which is Polynesian in origin but different still. Yum! !